Yes!!! Go Me. It's the last day of June and I couldn't be more excited about it. So for those who don't know and that should be most of you since I didn't really publicize it too much. My personal writing goal for the month of June was to publish a blog post everyday. And I did it. Today marks day 30 and I am so happy that's it's over. This month has been an amazing one. 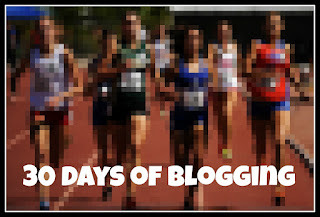 I've written about some amazing topics and hit some amazing milestones for my blog. I kicked off the month celebrating the love of my life with this post. I bared my heart well really the heart of my 15 year old self and shared the love I have for my hubby. To be honest I really can't think of one thing in particular that inspired me to write a blog post every day for 30 days. I think once I started writing I just kept thinking to myself let's not just stop here. Or I would say to myself let's try this again tomorrow and before I knew it I was challenging myself to writing a blog post everyday. I'm glad I did it. It renewed something in me. I enjoyed sharing my insights and perspective on life. I am so grateful for each and every reader and visitor. I want to personally thank each and everyone of you that read an article and left me a comment or special word of encouragement whether on the blog or on my FB or Twitter accounts. Thank You! You totally rock. I appreciate your support so much. It means the absolute most to me. I really do mean it when I say please leave me a comment if you enjoyed a post or relate in anyway. I do want to hear your stories too. Please feel free to share. Glad you asked. :) I am establishing a blogging schedule. Yes, me the girl who hates planning and budgeting and gets hives from calendars I am putting a line in the sand and setting up a blogging schedule. I'm committing to you my readers because you guys are awesome and I want to give you quality content on a consistent basis. Without further ado...here you go! Thank you again for reading it really does mean the world to me. And as I said leave me a comment I would love to hear which blog post of my 30 days of blogging inspired, touched, encouraged or enraged you.